The delicious blend of chocolate cookies dunked and crumbling into sweet cream, one of Hershey's most beloved candy creations, can now be enjoyed as an iced refreshment! Beat the heat or just savor the sweet with this instant Cookies & Cream blended ice mix. Mix (2) 70cc scoops (or 3 heaping table spoons) with 5 oz. chilled water, milk, or coffee. Add 12 oz. of ice & blend until smooth. 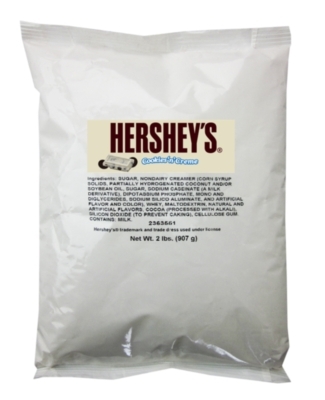 INGREDIENTS: Sugar, Nondairy Creamer (Corn Syrup Solids, Partially Hydrogenated Coconut and/or Soybean Oil, Sugar, Sodium Caseinate (a milk derivative), Dipotassium Phosphate, Mono and Diglycerides, Sodium Silico Aluminate, and Artificial Flavor and Color), Whey, Maltodextrin, Natural and Artificial Flavors, Cocoa (processed with Alkali), Silicon Dioxide (to prevent caking), Cellulose Gum.